The USMC Scalable Plate Carrier (SPC) is body armor that is lighter and more flexible than the USMC Modular Tactical Vest (MTV) or similar systems derived from the Interceptor Multi-Threat Body Armor System. Weighing only 25.4 lbs, SPC provides a body armor capability with greater mobility and reduced thermal stress in high elevations, thick vegetation and tropical environments than that provided by the MTV, while maintaining direct fire protection. 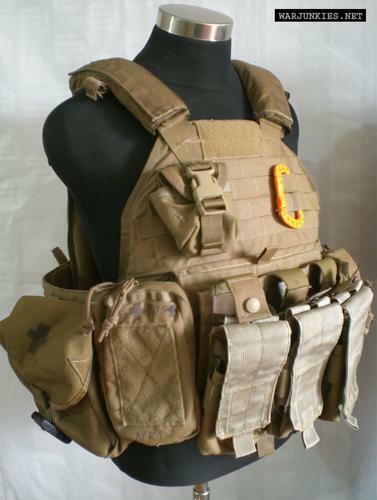 The Marine Corps Scalable Plate Carrier (SPC), as well as the USMC Modular Tactical Vest (MTV), are advances over the Interceptor Multi-Threat Body Armor System and its Outer Tactical Vest (OTV), the previous standard Marine body armor. Both the Marine Corps Modular Tactical Vest (MTV) and Scalable Plate Carrier (SPC) use the standard Enhanced Small Arms Protective Inserts (ESAPI) and Side SAPI plates to provide the best protection available against a wide variety of small arms threats. MTV and SPC offer identical ballistic protection. Coupled with the Modular Tactical Vest, the Scalable Plate Carrier provides options to address various mission/threat requirements. That is, Scalable Plate Carrier (SPC) will not take the place of the MTV, but will serve as a complement to it to be used at the commander\'s discretion. Approximately 14,000 Scalable Plate Carriers were fielded from mid-2008 through early 2009. Based on positive feedback, the acquisition objective was increased to approximately 65,000 plate carriers. The SPC is manufactured by Eagle Industries Unlimited, Inc., Fenton, MO. The carrier includes soft armor sewn into the front and back panels. The SPC utilizes a MOLLE attachment system with double rows of PALS webbing. There are slots on the front vest section for utilizing a groin protector.